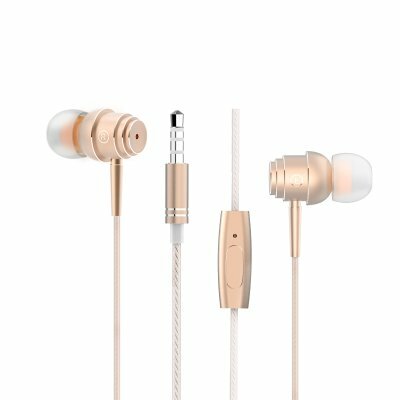 Successfully Added Elephone E1 Earphones - Noise Isolating, Built in Mic, 3.5mm Audio Jack, 3 Ear Tips (Gold) to your Shopping Cart. Elephone has come out with a super pair of noise reduction earphones that make a great accessory to any Smartphone or music player. With their elegant design and that's achieved through over 20 processing steps including diamond cutting, pattern engraving an anodizing the E1 earphones have a distinguished appearance and maintain a high-quality sound. Compatible with mainstream iOS and Android devices these earphones with built-in mic let you enjoy easy hands-free calls and music playback. A multi-function button ensures easy control putting you in command of incoming calls and music selection without needing to unlock up directly interact with your phone. Coming with 3 different sized silicone tips the E1 ear buds from Elephone bring a comfortable fit that cuts off outside interference so you can enjoy your music in perfect quality. A composite diaphragm and high purity copper wire ensure these in-ear earphones deliver the best audio quality possible. Utilizing TPE materials with high elasticity and tensile strength as well as having an aluminum alloy body means you will enjoy a great service life from these robust and wear resistant earphones. The Elephone E1 earphones come with 12 months warranty brought to you by the leader in electronic devices as well as wholesale headphones and earphones..